Meet G7x — the first and only comprehensive safety monitoring system with true last-mile connectivity to live monitoring personnel. Featuring an industrial-strength radio link, G7x communicates with the compact and portable G7 Bridge base station. Employees can work confidently over a mile away from the bridge knowing their safety is continuously being monitored in real-time. When your team needs the latest wireless gas monitor or remote lone worker technology, G7x and G7 Bridge work together to keep your teams covered, in even the most remote locations. G7x defines a new level of lone worker monitoring technology. With seamless satellite connectivity, the G7x solution integrates the latest Internet of Things technology to keep your teams — and their safety — connected. G7c delivers 3G communication for teams operating within cellular coverage in over 100 countries. 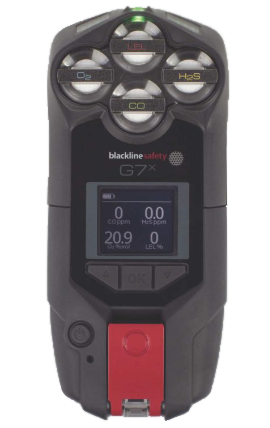 Blackline designed G7x to address every facet of your safety program. G7x gas monitors with lone worker monitoring leverage the G7 Bridge portable uplink base station to connect to available cellular and satellite networks. Connectivity transitions effortlessly to satellite when working beyond 3G range to ensure constant safety monitoring. G7x communicates with G7 Bridge using an industrial-strength 900 MHz radio link up to 2 km away. G7 Bridge connects G7x employee-worn devices to the Blackline Safety Network via satellite or cellular networks. Even outside of 3G coverage, G7x automatically watches over team members and calls for help, even when the employee can’t. G7x connects workers with live monitoring teams 24/7 — should a gas leak, fall, no-motion or health incident occur, G7x equips responders with the situational awareness needed for optimized emergency responses. G7x with G7 Bridge can communicate with monitoring personnel using two-way text messaging delivering critical insights to workers, such as muster points during an evacuation. G7x tailors gas detection to specific work conditions with its exclusive modular design. Configurable cartridges make gas detection scalable to job requirements, with a selection of customizable gas sensors available. Choose a Standard (no gas), Single-gas or Quad-gas cartridge, then select from a range of gas sensors including hydrogen sulfide, oxygen, carbon monoxide and combustible gases, with more in development. A modular design means G7x can scale from a single-gas monitor up to a four-gas detector. Blackline’s gas sensor-as-a-service replacement program helps teams maximize product uptime and ensure seamless gas detection and safety monitoring while minimizing maintenance costs. Customize and configure your G7x gas detector cartridges and sensors. G7x features a brilliant LCD screen — the graphical display is readable in direct sunlight and backlit for low light conditions. Simple displays and intuitive menus are easily navigable for straightforward use. The integrated SOS latch pull feature connects workers with monitoring personnel instantly, while the latch push button allows for easy check-ins and alert management. Interface functionality is complemented by constant connectivity — when the G7c’s green SureSafe® light is on workers can be confident their safety is being monitored, wherever they may be. Vivid yellow lights accompanied by sound and vibration signal that G7c has a message for you, or is asking if you are OK. Red lights with escalated sound and vibration indicate assistance is needed, or that a yellow alarm has not been responded to. Upcoming bump test and calibration reminders are easily accessible through G7x’s screen. Devices work with Blackline’s G7 Dock for simple bumps and calibrations. Test actions are performed using G7x’s LCD menu screen and provide straightforward dock functionality. Seamless, comprehensive safety monitoring is empowered by Blackline Live, the web monitoring portal at the heart of the G7x solution. Employee-worn gas monitor devices can be easily configured for specific work conditions and environments. Emergency response protocols and device settings are configured in user accounts and provide monitoring personnel with the information necessary to manage an optimized emergency response. Upload custom facility maps and floor plans to amplify response capabilities and direct responders directly to the employee’s location within the context of their surroundings. From the onset of an incident through to resolution, Blackline Live provides all the tools necessary to manage a world-class safety monitoring program, even in the most remote environments. Constant connectivity to cell or satellite networks through G7 Bridge ensures that each G7x gas monitor is remotely configurable and that firmware updates are automatic for consistent and up-to-date operation. G7x shares current setup and configurations with employees at every start-up. From detecting gas leaks to monitoring lone workers and evacuating facilities, workers are covered — every safety incident and gas alert is communicated instantly to Blackline for storage and reporting. G7c delivers comprehensive gas detection and safety incident coverage for the diverse work environments faced by teams every day. G7c gas detectors wirelessly communicate compliance and usage data for automatic reporting to Blackline Live, alleviating the need for manual data collection from docks in the field. Every gas reading and safety incident is transmitted to live monitoring personnel in real time. Whether a worker calls for help using their SOS latch or a gas leak or safety event is detected, employees can rest easy knowing that details of their situation are being communicated to monitoring personnel, and that help is on the way.